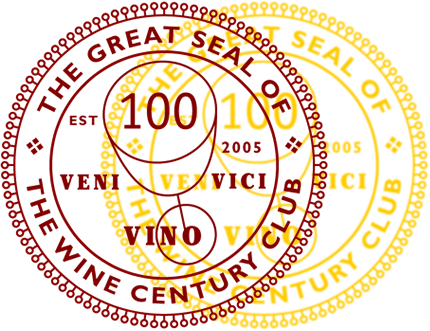 The wines discussed in this article were provided as samples by Rudi Wiest Selections. I remember talking with my good friend Stefano of Clicks and Corks sometime earlier this year, and we were talking about blogging and samples we sometimes receive. He was astonished that I did not seem to get as many samples as he receives (he blogs mostly about Italian wines), and I had to inform him that there are simply not that many distributors of scale that carry German wines: Rudi Wiest and Terry Theise being the two big ones, with several smaller importers like vom Boden filling in the niches. I told him I wish I could get to try some of Rudi Wiest of Terry Theise’s portfolio, but that it was unlikely, being rather far away from the bigger markets. Imagine my surprise and happiness when I was approached by Tina Morey of Protocol Wines, the host of #WineStudio and #WineChat, informational weekly wine chats on Twitter, asking whether I was interested in participating in the #WineStudio they were organizing in cooperation with Rudi Wiest Selections to highlight some lesser known varieties from Germany!! I happily obliged. If you’re into German wine, it is hard not to have had wines that Rudi Wiest imports. Their list is not very extensive, but they boast some of the best producers in Germany. #WineStudio is Protocol Wines’ wine education program in which wineries and distributors get a chance to provide a deeper look into what they or their area is doing wine-wise. The discussions are a lot of fun, I have to say, so it is usually worth checking out even if you don’t have the wines to try along. While Germany doesn’t have the grape variety that Portugal or Italy or Greece have, there are still a bunch of grapes that are not really well known abroad but drunk by a significant number of Germans. This was our chance to explore these more. We tried and discussed a total six wines over the course of four weeks, and in my book this was hands down the best #WineStudio event yet. I guess my predisposition for German wines and some background knowledge made this a really great exercise. Let me tell you about the wines, because they pretty drinkable! Also, they were all dry wines and I get many questions about which dry wines from Germany I can recommend, so this is a good list. 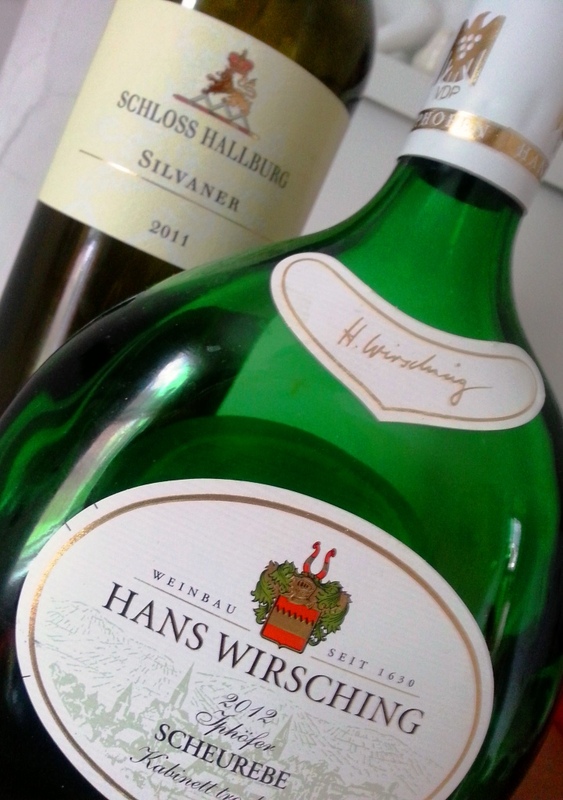 We started with a 2011 Graf von Schönborn – Schloss Hallburg Silvaner Dry and the 2012 Hans Wirsching Iphöfer Scheurebe Kabinett Dry, both from Northern Bavaria’s region Franconia (Franken). Silvaner, a cross between Traminer and Österreichisch-Weiss (literally “Austrian White”), rules in Franken. I have heard frequently that Silvaner is the grape for people that cannot deal with the acidity in Riesling but like Riesling aromatics, and it is widely used in Germany as a very food friendly wine. Scheurebe was created in 1916 by Mr Scheu by crossing Riesling with an unknown wild variety and is considered highly aromatic. The 2011 Graf von Schönborn – Schloss Hallburg Silvaner Dry (12.5% ABV) was quite expressive in the nose, with tons of peach aromas, with melon and pear and some baked apple complementing the picture. On the palate, the wine showed hints of coconut, good balance, and a certain creaminess. I was missing some acidity, but that is just something I want in my whites, and 2011 wasn’t kind to those loving acidity…All in all a tasty wine that should be great with sushi from what I heard from others. The Rebholz Pinot Blanc (13.5% ABV) had a fresh nose with stone fruit, pear and melon as well as hints of vanilla (I doubt it saw any wood in the production process, though). On the palate, the wine was warming yet crisp, with coconut, liquorice, lychee and pear aromas. There was a good balance in the wine, despite the significant alcohol it still felt light-footed and had good length. The wine was made from mostly 70 year old vines, which is pretty impressive for an entry level wine. I liked this expression of the grape. 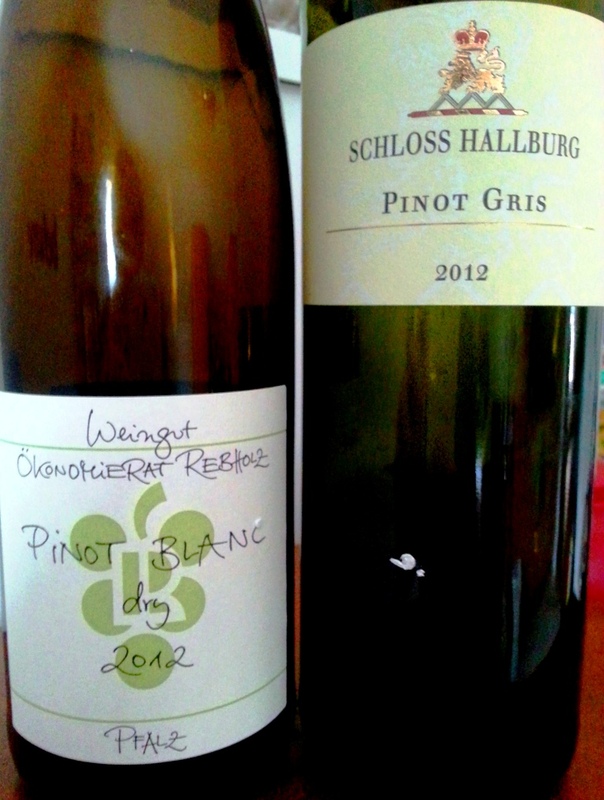 The Schloss Hallburg Pinot Gris (12.5% ABV), in contrast, was much more subdued on the nose. I got lemon, apples, almonds, and in general the aromas seemed more ripe than in the Pinot Blanc. The wine had a great mouthfeel to it, it was deep and drawing me in, with good heft and good acidity. The aromas I mostly got were peaches and melon paired with nice creaminess. This wine was rich, and yet remained refreshing. The interesting thing was that it felt heavier than the Pinot Blanc, despite having significantly less alcohol. 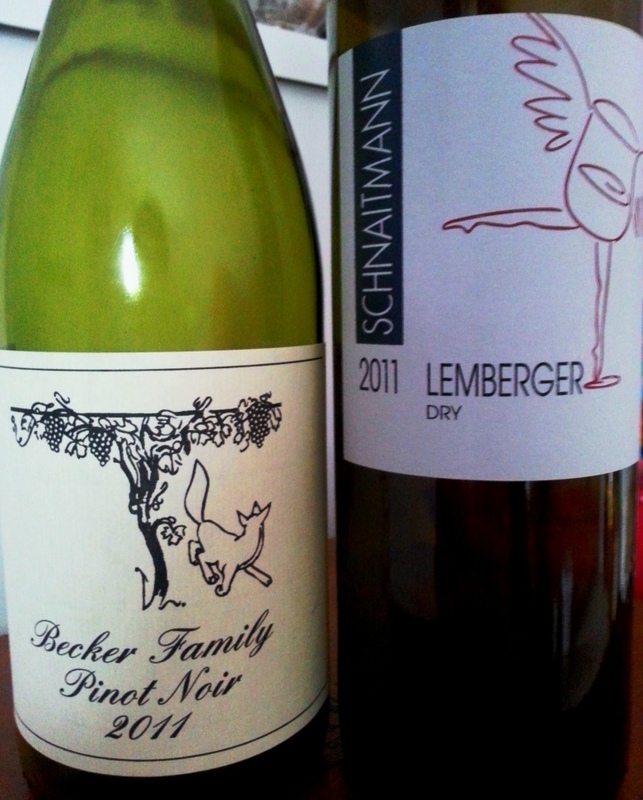 The final week was dedicated to two red wines: A 2011 Becker Pinot Noir Dry (from the Pfalz) and a 2011 Schnaitmann Lemberger Dry (from Württemberg). Germany has actually been making great strides in producing Pinot noir (also known as Spätburgunder in Germany), and it is always exciting trying more of these. Lemberger is prominent grape in the Southern-most parts of Germany. The Becker Pinot Noir (13.5% ABV) poured in a surprisingly dark cherry red. I loved its nose, which was full of gummibear aromas (open a bag and stick your nose in, it’s divine!) and cooked cherries. On the palate, it was initially soft and pleasing, with good acidity. Then, it became spicy, with tons of cassis and red currant aromas, some branchiness with was welcome, and some smoke. The currant aromas persisted throughout the finish, and that made me like the wine. It might have been a bit rough around the edges, and there were some bitter aromas in the finish, but overall a decent wine.